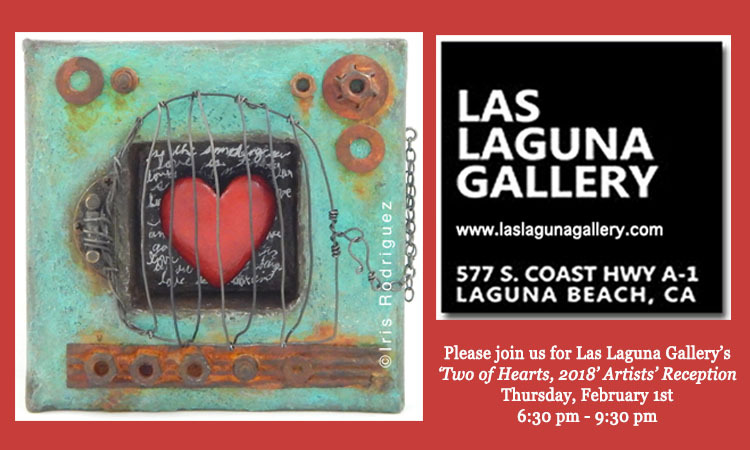 I am so over the moon to be part of the Las Laguna Gallery "Two of Hearts" exhibit for the month of Feb. The exhibit runs Feb 1-24 2018. The Artist Reception and Opening is Thursday, Feb 1st, from 6:30 to 9:30 pm during Laguna's First Thursday Artwalk. Additionally, my piece, I call "Caged Heart" is featured in their promotional materials, check out the postcard image below. A little about this piece. It an assemblage; the substrate is the back side a deep canvas, where I used the opening created by wood frame as a niche. I used wire, polymer clay, found objects. In a way, our current divisive environment inspired this piece. I believe that deep down in our hearts lies our true humanity. However, we choose to open ourselves to who we are-humans who love. Or we could choose to keep our hearts caged. To do so is to limits our inner selves, our view of the world; clamp down on our passion, creativity, and emotions.